One of the most transformed neighborhoods, if not the most transformed neighborhood, in the city in recent years is the Mill Creek neighborhood in the heart of West Philadelphia. Mill Creek was once home to one of the biggest and ugliest housing projects in the city, the Mill Creek Homes, a typical 1950s housing project. I saw this imploded in 2002 and watched over the years as it was replaced with a huge redevelopment known as the Blackwell Homes. A year before the implosion, I had walked through there doing research for a class project. After walking two blocks north of Haverford Avenue, I decided it was best to turn back, as Mill Creek was probably the most blighted, poorest, and most dangerous neighborhood in West Philadelphia at the time. But as I alluded to, walking through Mill Creek today one would find it hard to imagine that it had ever been such a troubled and deteriorated neighborhood. In fact, when the implosion happened a little more than eight years ago, a community activist declared, “Mill Creek will be the finest neighborhood in the city!” At the time I thought that statement was just extreme optimism, but now I think a case could be made. 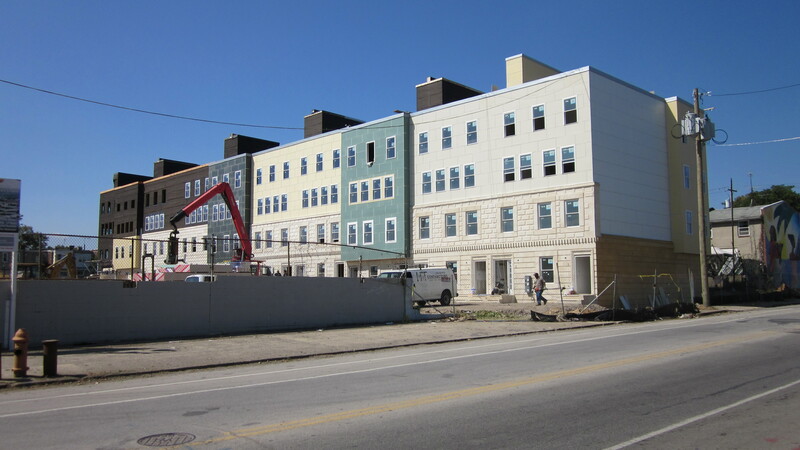 Certainly a case could be made that it may be the best example of transforming a severely blighted and troubled neighborhood into a safe, clean, and very livable neighborhood for working class families. This, then, brings me to the point of this post. In addition to the expansive Blackwell Homes, which are hundreds of twins and townhouses spanning 44th to 47th Streets north of Haverford Avenue, there have been several smaller Housing Authority and community redevelopments on neighboring blocks, including a redevelopment on Markoe Street where a competition was held among local architecture firms for the redesign of a largely abandoned block. 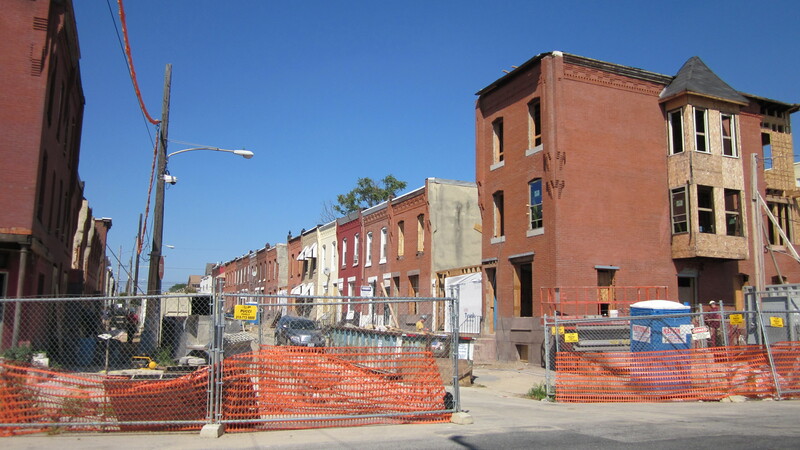 The Blackwell Homes is just north of the Nehemiah Homes, another redevelopment between Market Street and Haverford Avenue that garnered headlines in 1995 because they were the first redevelopment of that size in the middle of West Philadelphia. So extensive and successful is the redevelopment of Mill Creek, that now a large market rate redevelopment is currently being built (not proposed, but actually under construction) on the northwest corner of 48th & Brown Streets, about a block away from the edge of the Blackwell Homes. 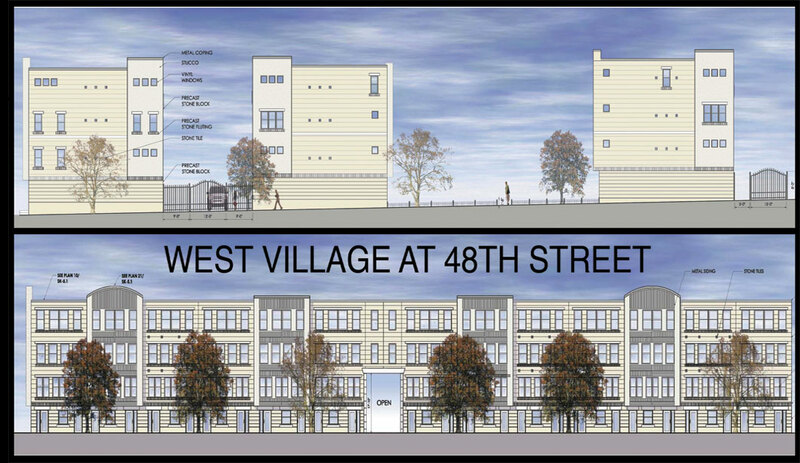 The new development is called West Village at North 48th Street, and it is a development of 86 stacked townhouse condos on two acres in a semi-gated community, being built by B & T Home Builders. 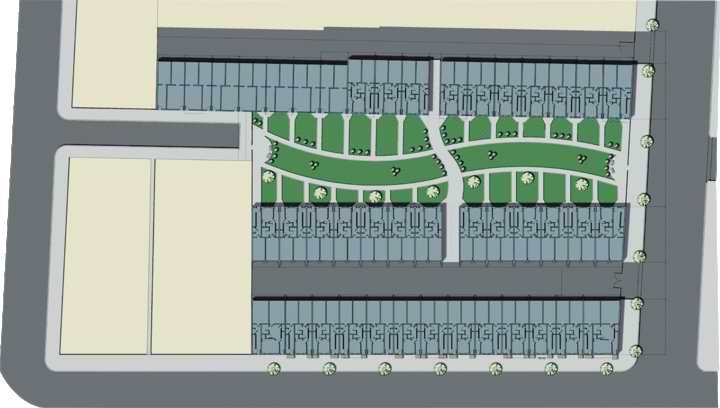 The townhouses will have three rows: one facing Brown Street with garages in the back, and two facing a courtyard in front with garages facing the back, sharing a driveway with the row of homes on Brown Street. The design is modern, with some traditional, Mediterranean-style elements. The buildings will have green rooves and sustainable features. They will all be three and four bedroom units, starting at $225,000. 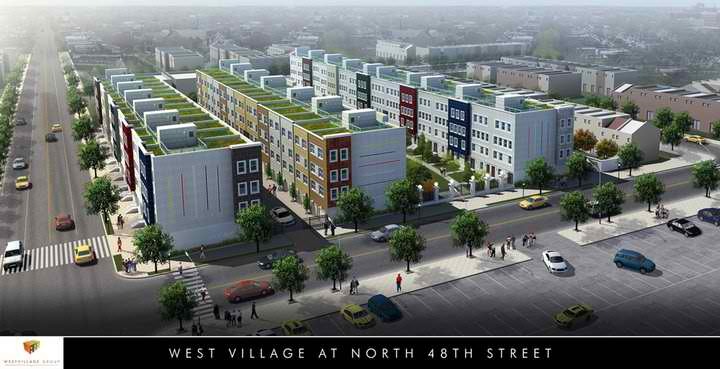 To me, this development is the surest sign of West Philadelphia’s economic rebirth. This is not University City or City Line Avenue. 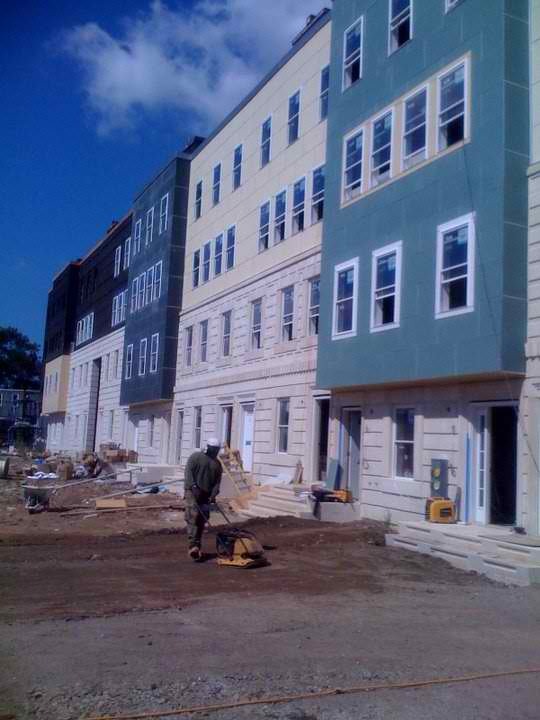 This is the middle of West Philadelphia and this development is not subsidized by the government at all. And unlike most of the country, they are currently building phase one (about a third of the overall development). Nothing says that West Philadelphia is economically strong than when private developers decide to invest there, especially during a recession. And this is an area that, as I said, was one of the worst in West Philadelphia, but clearly no more. Adding to the neighborhood will be the big new Lucien Blackwell Community Center, the new West Philadelphia High School building at 49th and Chestnut Streets (which is under construction), the new El station at 46th & Market, a big new shopping center at 52nd Street and Lancaster Avenue that has retailers such as Lowe’s, Planet Fitness and Shoprite, and an extensive streetscape improvement project on Lancaster Avenue that has rebuilt most of the sidewalk between 38th Street and 52nd Street and includes new trees surrounded by brick pavers. The redevelopment of Mill Creek will certainly help with the revitalization of the neighborhoods adjacent to Fairmount Park, which I have already mentioned are experiencing several other developments. And it will eventually create an extension of University City, making neighborhoods attractive for students and middle class, high-tech and university workers in the middle of West Philadelphia, not just adjacent to the campuses. For more info, you can click on the links above and view the pictures that I have here. 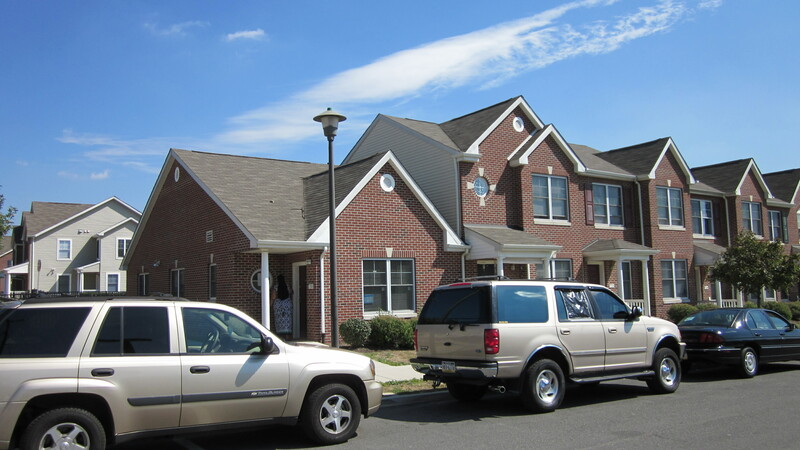 I would like to know if you have 3 bedrooms in West Villiage of 48 Street? I also like to know how soon can i move in? I don’t do the leasing for West Village. You can click on the link in my article.